Now that Swift is open source, many interested users might be installing and testing it on their Linux systems. However, currently the Foundation framework is still very much a work-in-progress so if you’re interested in developing more than a simple shell app, you’ll need to link against existing Linux libraries like GTK, Cairo, or libpng in order to gain access to useful functionality. I just finished implementing a simple Swift app which links against X11, the most basic Unix UI library [fn:: I started with GTK3, but could not get that to work]. In this short tutorial, I’ll show how to write a simple X11 app, and how you can utilize this to link against other libraries. 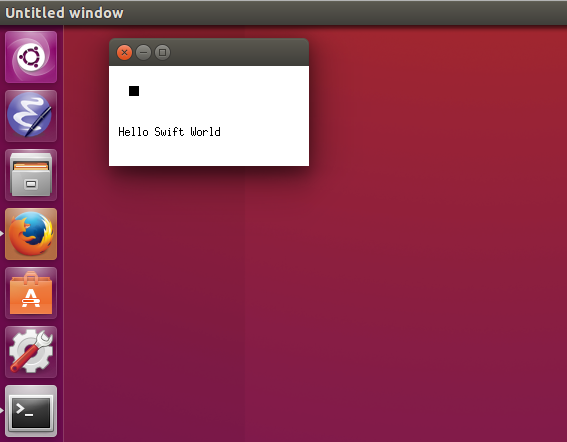 In the process, we’ll also use the new Swift package manager to create a simple re-usable package for the X11 library. Before we write our actual X11 app, we need to define a Swift package which defines the links against the X11 library. Once this is done, we can easily share this package with other users, or re-use it in other projects. We have to differentiate between defining a package and using a package. Let’s start with the first and then see how we can use that package. We’re naming our module CX11 and we’re creating two submodules. One for the Xlib and one for X. Each submodule defines the header it needs to import. Finally, we’re linking against libx11 via the link statement. That’s it, our package is defined, but how do we use it? After we opened the display, we’d like to get the current default screen as well as the current root window. The RootWindow macro is not available[fn:: See above, I couldn’t figure out why], so we will access the memory section of the C struct directly. However, as the current screen s is a UnsafeMutablePointer, we need to add the memory property in order to access the root instance. Our e event structure is - again - a UnsafeMutablePointer, so we have to access the actual structure via the memory property. The Expose event means that the window is visible, so we have to re-draw it. Our drawing is very simple: We’re using the XFillRectangle call to draw a small black box, and the XDrawString call to draw our initial msg text in the window at position 10, 70. Please note that I don’t know whether X11 expects unicode or ascii, so the Int32(msg.characters.count) is probably wrong, but it works in this example.